ΚΕΝΤΡΙΚΗ ΡΑΔΙΟΦΩΝΙΑ ΝΟΜΟΥ ΕΒΡΟΥ: Is "Kurt Seyit ve Şura" coming to an end? 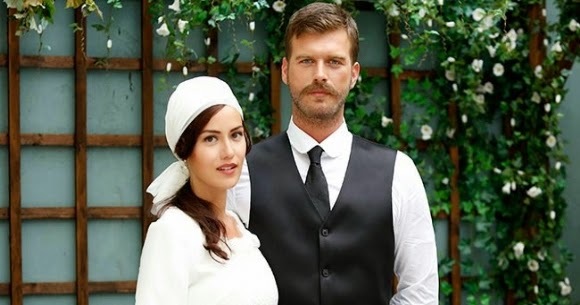 Is "Kurt Seyit ve Şura" coming to an end? Bad news for fans of the series" Kurt Seyit ve Şura" . Hoping that the addition of Fahriye Evcen to the cast of the series would bring the ratings up the series is facing disappointment. According to certain reports the series costs approximately 800,000 TL per episode. However the return is not what had been expected. The series has been pre-sold to 13 countries internationally. Therefore production will continue for 13 more episodes before ending. The series which started in March was anticipated to be a huge hit with its starring cast. The first two episoces where shot on location in Russia. Once moving the series to Turkey the ratings slipped. Reports blamed the leading actress Farah Zeynep Abdullah for not keeping up with the performance of Tatlıtuğ. For this reason the addition of Fahriye Evcen who protrays Mürüvvet and Zerrin Tekindor who protrays her mother was the hope that the producers had to boost the ratings. Unfortuantely with its season premiere the ratings were not what was anticipated. Therefore with advertising dollars which are already in place, the series costing approximately 800,000 TL per episode can only continue for 13 additional episodes, and will therefore air its finale at the end of 2014. Αναρτήθηκε από ΚΕΝΤΡΙΚΗ ΡΑΔΙΟΦΩΝΙΑ ΝΟΜΟΥ ΕΒΡΟΥ στις 10:06 π.μ.